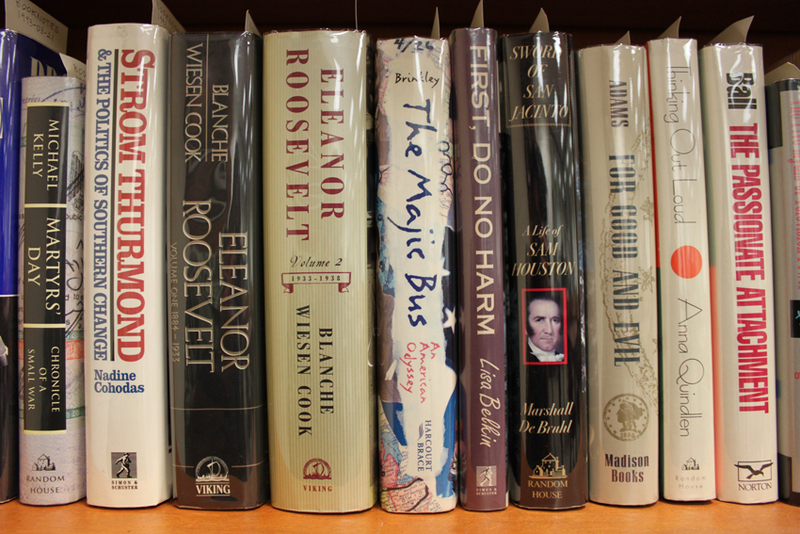 Some of the 801 volumes that are part of the Brian Lamb Booknotes Collection, George Mason University Libraries, Special Collections & Archives. One of the many unique collections housed here at University Libraries’ Special Collections & Archives department is the Booknotes collection. Booknotes was a popular television program on C-SPAN hosted by the network’s creator, Brian Lamb, which ran from April 1989 through December 2004. The weekly hour-long program featured intense and educational one-on-one interviews with non-fiction authors. Notable guests included Hillary Clinton, David McCullough, and David Crosby, as well as former presidents Richard Nixon, Jimmy Carter, and George H.W. Bush. A grant from the C-SPAN Education Foundation has allowed SC&A to preserve Lamb’s personal copies of the 801 books that were covered on the program along with notes, correspondence with authors, and reviews. To add to this collection the “Booknotes Oral History Project” began in the spring of 2014. The project interviews authors who appeared on and others who were involved with the Booknotes television program. To date we have completed 25 interviews. Through these interviews we investigate the impact of Brian Lamb, C-SPAN, and Booknotes on then-contemporary political thought, the reading public, and the individuals involved. 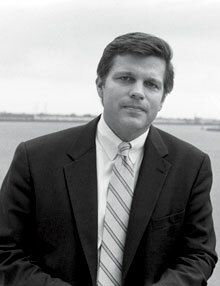 Author Douglas Brinkley. Courtesy of Rice University. Our most recent interview took place on December 11, 2014 with author Dr. Douglas Brinkley. Dr. Brinkley is a leading historian in American, corporate, presidential, and conservation history who is a professor at Rice University, a fellow at the James Baker Institute for Public Policy, the history commentator for CBS News, and a contributing editor to the magazines Vanity Fair and American Heritage. Because of his prominence we were enthusiastic to secure Dr. Brinkley’s interview. Author Douglas Brinkley appearing on the Booknotes program, April 18, 1993. Courtesy of the C-SPAN Booknotes website. Despite suffering from a chest cold, Dr. Brinkley spoke for nearly an hour about his experience on the program and how his Booknotes appearance, and subsequent friendship with Brian Lamb, ignited the career of the newly-emerging scholar. 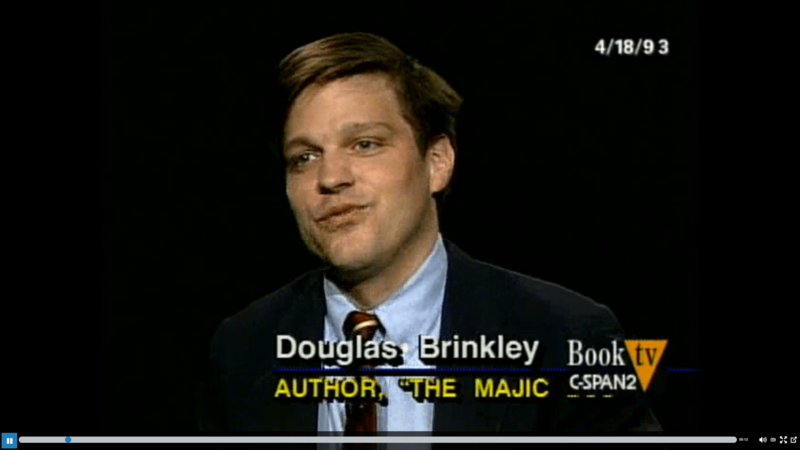 Dr. Brinkley appeared on Booknotes on April 18, 1993 to discuss his book ­­­­­­The Majic Bus: An American Odyssey. The early exposure of Booknotes was a huge launching pad for his career. This helps to show not only how the program could affect an individual author’s career, but it also shows the ways in which Brian Lamb and C-SPAN were tastemakers, influencing which authors became significant voices in American thought. Dr. Brinkley also discussed how important he thinks the Booknotes collection and oral history project are. The complete Booknotes collection is available for viewing in the SC&A Reading Room, Floor 2, Wing C of Fenwick Library.